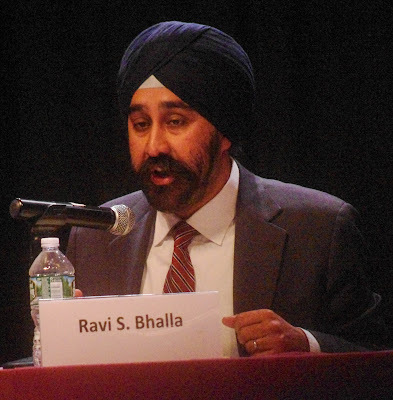 Ravi Bhalla stuns Hoboken saying costly errors and broken promises will see him resign as mayor. In a stunning decision reevaluating politics locally and nationally, new Hoboken mayor Ravi Bhalla declared he's resigning as mayor, effective the close of business. "I don't like what I'm seeing in Hoboken, the county (HudCo) and around the country. I don't like what I've become, another cog in a wheel of destructive scorched-earth politics after some unfortunate mistakes made," said the soon to be departing mayor. With the public shock simmering after his taking a second job with a Republican law firm, Ravi Bhalla saw a light bulb go off. "It's killing me, the complaints from residents, the political money games in this state we play," he said adding, "It didn't help after receiving 32% of the vote to break a major promise so early into my term alienating many Hoboken residents. I couldn't hold the frame after that." of his second job with a Republican anti-gay law firm outraged residents. Sources say his declaration of victory on Union Dry Dock was the final straw. During the 2017 mayoral campaign last year, Bhalla promised the public he was leaving his job as a law partner with a politically connected Democrat law firm thus avoiding the potential for conflict of interest charges. He said he would focus on Hoboken as his sole interest and enough Hoboken residents took him at his word, albeit a slender 32% of them. Then a mere month into his term as mayor, Bhalla was back on the payroll of another NJ politically connected law firm, this one with an anti-gay history and Republican. The plan putting him on the payroll 31 days into his term was obviously not hatched overnight. Ravi Bhalla had been deliberately deceiving Hoboken residents all along. It rattled Hoboken including many who had pulled the lever for the two-term councilman. That suspect legal gig included a $60,000 annual salary plus a rich uncapped commission plan to drive business, re: NJ public contracts, municipal and other public sector related favors traded behind closed doors day in and day out in the Soprano State. Hoboken's new mayor had announced he was a Soprano State playa. He wanted to move up the ladder in Joisey politics in the Democrat Party and this was his designated roadmap. Bhalla dumped the news of his Republican law firm employment contract on a Friday night on Facebook and limited a personal defense to his paid political operative's website. Everyone else including legitimate media was forced to wait weeks as a circular spiral of bad arguments failed to persuade the Hoboken public leading to weak admissions by a small coterie of insiders called Ravibots that "the optics were bad." Bhalla trotted out several arguments about the suspect employment contract with the Republican law firm, first claiming it was for mentoring young attorneys and offering strategic advice. Then after a public backlash led by the issued statements from council members including the good government trio of Peter Cuningham, Jen Giattino and Tiffanie Fisher; Ravi Bhalla tried the most unbelievable desperate excuse of all: saying the fat employment contract wasn't a job at all. The Hoboken public listened, familiar with tall tale narratives in the Mile Square City and collectively rolled their eyes. Then they got mad insisting the City Council take action. Questions by the legislative body came back with limited and some say arrogant answers. No one knows Bhalla's money haul to date and so-called oversight by a political contributor heading the Corporation Counsel Office is viewed as a theater of the absurd gag. City Council President Ruben Ramos expected to be sworn in as Acting Mayor shortly called the alleged moneymaking Bhalla employment contract a "no-show job." For good measure, Ramos added, "The only thing that's missing is Solomon Dwek and the FedEx envelope." He declined further comment until later this week. One political observer connected to the defunct Hoboken Reform Movement responded to the news saying, "He used a lot of people who fought for good government in Hoboken over many years. He bided his time and the first thing he did after taking the mayor's job was betray everything we stood for trading on the office of mayor to enrich himself. It's utterly despicable." Another longtime Reform and good government advocate, Kurt Gardnaire said, "He makes Peter Cammarano's $25,000 bribe at the Malibu Diner look like pocket change. I've been calling this scandal out for weeks and condemn all Ravibots and paid political operatives who latched on and backed this diabolical illicit scheme for money and power. What do you assholes have to say for yourselves now?" Hoboken resident Leo Topal who voted for Bhalla announced with somber tones. "He's taken big piles of special interest money from outside Hoboken aligning with a PAC during the election but with this employment contract, he's set good government in this town back decades. I fell for the anti-Trump propaganda like others hook, line and sinker. He conned us." Others are awaiting the official release of a resignation letter from City Clerk James Farina before commenting. One council member quipped, "Let's see if Ravi will do what's right for Hoboken. This could be another false flag operation like that Ravi "terror flyer" where he makes himself out to be the victim. There's a pattern. When his corruption is highlighted, he plays the victim." Councilwoman Jen Giattino upon hearing the news asked, "Is he going to apologize to the people of Hoboken?" A final factor in Bhalla's decision to resign according to sources is the impending backlash for Hoboken's defeat on Union Dry Dock. NJ Transit is expected to vote this Wednesday at an emergency meeting to take control of the Union Dry Dock property trumping Hoboken's eminent domain's action. One big bro fan said, "It was a political mistake to publicly declare victory when NJ Transit urged delaying action. Ravi probably shouldn't have done that. Many people are complaining after Ravi tried to rally the public again because they were told Hoboken had won." What of rumors Governor Phil Murphy asked Bhalla not submit an eminent domain action to the City Council for approval? Another familial source said with no small measure of disconsolation, "I can't say much on those discussions but maybe we should have taken a different path with the new governor but Ravi was advised to 'hold the frame.' Clearly, this is a tragic mistake for Hoboken and one alienating Governor Phil Murphy." A Murphy spokesperson declined to offer any official statement but hissed, "He told Ravi not to put up that eminent domain resolution so a plan could be worked out. Now Ravi and Hoboken are dead to the governor." A minor point in the aftermath but what will happen on the Hoboken Democratic Committee and Bhalla's efforts to malign and overthrow its chair, Councilwoman Tiffanie Fisher? "The committee can do what it wants but she's done a great job there after I asked her to take on the role. Her efforts make Hoboken voting integrity better, something we should all work towards, especially considering voter fraud problems in Hoboken," Bhalla said. Speaking of his future, the soon to be departing mayor was elusive but somewhat morose. "The divide in this country is enormous but manipulated. I won't be a party to it any longer. There's a storm coming. I see it, every party person in both major parties sees it. Serious crimes have been committed against the Constitution. It's not about a single individual or party. It's far bigger. I'm out." Speaking wistfully of what transpired in his short term as mayor, the departing Sikh mayor added, "It's better to be successful living your life than trying to destroy every person in your path clawing for scraps of political power. I'm an example of how it should not be done." A final reflection on his decision, Bhalla pointed at Hoboken politics. "I don't want to continue to see Hoboken (politics) operate this way. Last year, my campaign destroyed Jen Giattino with a slew of fabrications then someone attacks me with a terrorist flyer. Where does it end?" City Hall and the mayor's office were stunned by the new mayor's sudden resignation. Senior aides and political operatives declined official comment while the official City spokesman Alejandro Melli-Zeebra Jr. said more details would be forthcoming after a last-ditch effort to reframe Hoboken's defeat on Union Dry Dock. But an aide in the mayor's office had more immediate concerns. "When City Council President Ruben Ramos comes in this week as Acting Mayor, he's going to take a flamethrower to this place. The political appointments in the mayor's office, the law department, the directors know they are on the chopping block. Most probably won't survive the week." Dawn Zimmer, who endorsed Bhalla for mayor declined comment. Observers report she was seen on Observer Highway late Sunday night walking her dog Buddy muttering, "Ravi is the only one I trust" over and over staring off into the distance. A special election for Hoboken mayor will be set in November.